Note that there are 2 copies of this list. The first one has no hyperlinks, but if you keep scrolling down, the second one has links to more information. This has been done since some people have visual difficulties with the high-lighted links. 1. Everyone is being subjected to unlabeled toxic chemicals via fragranced products, and removing them makes the air quality healthier for all to enjoy. 2. Millions of people are injured and disabled by fragranced products, and having to avoid exposures restricts their lives in almost unbelievable ways, so removing fragrances is a practical way to provide disability related accommodations, in other words, fragrance-free policies remove accessibility barriers that are systemic and virtually impossible to navigate one person at a time. 4. The fragrance industry is unregulated and their front group just hired an ex Monsanto and CropLife (pesticide industry front group) pro to oversee their “efforts in science policy and regulatory affairs”. What all are they trying to hide? 5. They have already gotten their industry concoctions into virtually every place on this continent, including all kinds of items for children, so that it’s almost impossible to find things that do not have 1st, 2nd, or 3rd hand fragrance contamination (including food and baking soda) – and their substances are not certified as being child or food-safe (indeed, many are toxic at any level). 6. Fragrance concoctions are known to target our bodies and brains like drugs do, and manipulate our senses without our knowledge or consent. 7. The VOCs from these products (and pesticides, paints, and glues) cause as much or more outdoor pollution as vehicular traffic now. 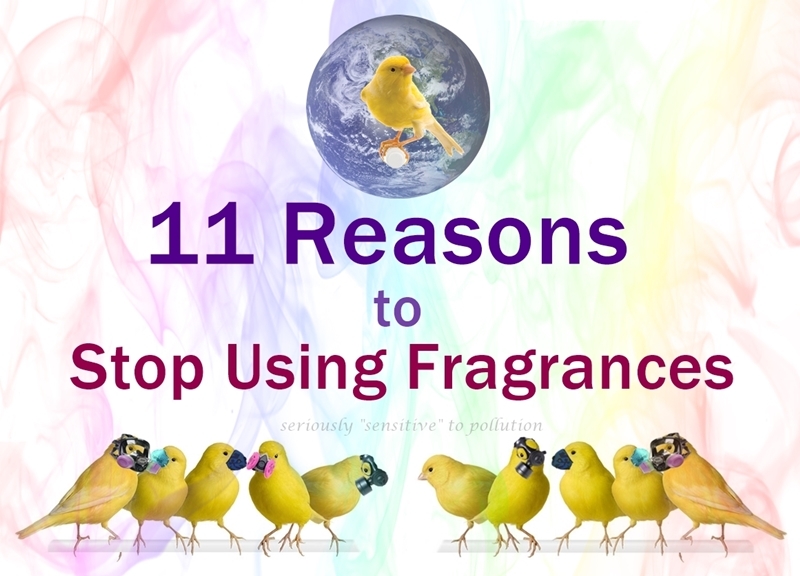 Fragrance pollution is significant source of harmful pollutants in every neighbourhood! 8. At least 34.7% of the population experiences adverse health effects from exposure to fragranced products. 9. Removing accessibility barriers is good for mental health. 10. There is no right to wear fragrance. 11. Using fragrance is completely unnecessary to live a happy, healthy life! Bonus point: Clean has no smell! 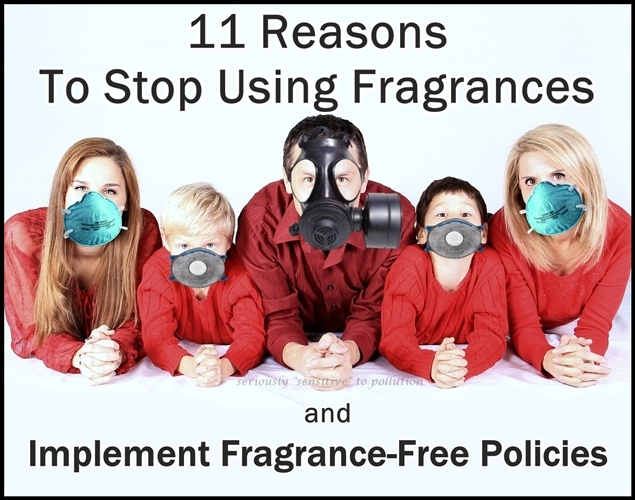 How many more reasons do we need before fragrance-free policies are created and enforced everywhere, just like we do with no smoking policies to protect public health? Isn’t this enough? 4. The fragrance industry is unregulated and their front group just hired an ex Monsanto and CropLife (pesticide industry front group) pro to oversee their “efforts in science policy and regulatory affairs”, efforts which in addition to causing preventable health harms to who knows how many generations of people and other living beings, also make prisoners out of the wrong people. Think about that. We all know pesticides kill. The pesticide industry has spent millions to vehemently and successfully fight many regulations and restrictions. Why does the fragrance industry need to hire a top gun like that to protect them from regulations and policies that would restrict their use? What all are they trying to hide? This entry was posted in Accessibility, Air Quality, Environmental Health, Fragrance, Health, Human Rights, Pollution, Public Health and tagged allergies, asthma, cancer, chemical sensitivity, environmental sensitivities, essential oils, fragrance-free, hazardous air pollutants, health care access for people with MCS/ES, MCS, mental health, petrochemicals, VOCs. Bookmark the permalink. Another great article! As someone who is extremely limited in my ability to go places and do things because of scents, I thank you for getting the word out that scents are accessibility barriers. After years of thinking it was just me, and slowly needing to limit my life in increasingly restrictive ways (since I didn’t have access to all the information and practical supports that could have prevented my health and abilities from deteriorating so much), I discovered more and more people who were also experiencing similar barriers, and when the obstacles in my life became life threatening, I decided not to go down quietly, but to try to speak up for those who no longer had a voice or could not use theirs. Most people are still afraid to speak up about what is happening, except in the private support groups, so we remain essentially invisible to the world, and unfortunately, that is exactly how industry wants it to be. They don’t want the world to know how their products are harming people (and the environment). For the life of me, I can’t figure out why they insist on peddling such harmful products, made with substances that not only harm us now, but also cause epigenetic changes with health and cognitive problems for future generations (whose lives they are actually endangering now), when there are so many kind and wonderful things they could be doing instead. Money is just a human construct, it’s not worth poisoning the air, water, soil, food, people, and all other life forms for. Instead of causing more suffering, we need to care about all living beings, and work on creating a kind, compassionate, healthy, restorative, and regenerative world. Thank-you for all you do Linda! Here’s a resource some of you may find helpful. Alison Johnson’s 2018 version of the Fragrance-Free Workplaces is available on vimeo and to purchase as a dvd. This film featuring Multiple Chemical Sensitivity can be purchased on http://www.alisonjohnsonmcs.com. Please visit that website to donate online a few dollars or a larger amount so that we can afford to continue letting people worldwide watch the film at no charge. Further information about Multiple Chemical Sensitivity can be found on the website http://www.chemicalsensitivityfoundation.org. She has apparently provided the video to all 40 Senators in California as well as 80 members of the California Assembly. I am hoping to someday meet someone who can help me organize things to make it easier to find info and more useful for non-mcs people too. For now, the search box is helpful if you are looking for something more specific.